Here is a proper estate property. A splendid approach curves along a creek up to a magnificent home articulated in stone and brick, surrounded by wide manicured lawns and a wooded perimeter. 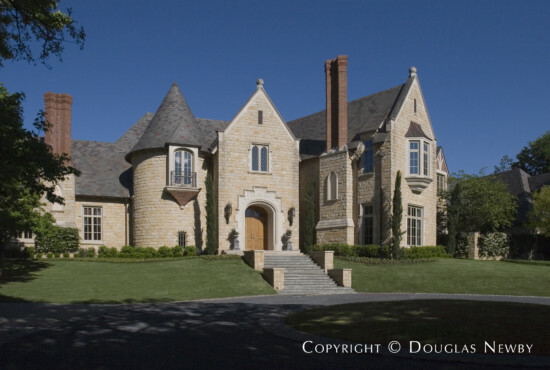 Other 14,000 square foot homes in Dallas have been built, but where do you find one that is private and gracious, removed from a road, and not in sight of other homes. In what other city within eight miles of an internationally recognized Arts District can you find such architectural and bucolic excellence. 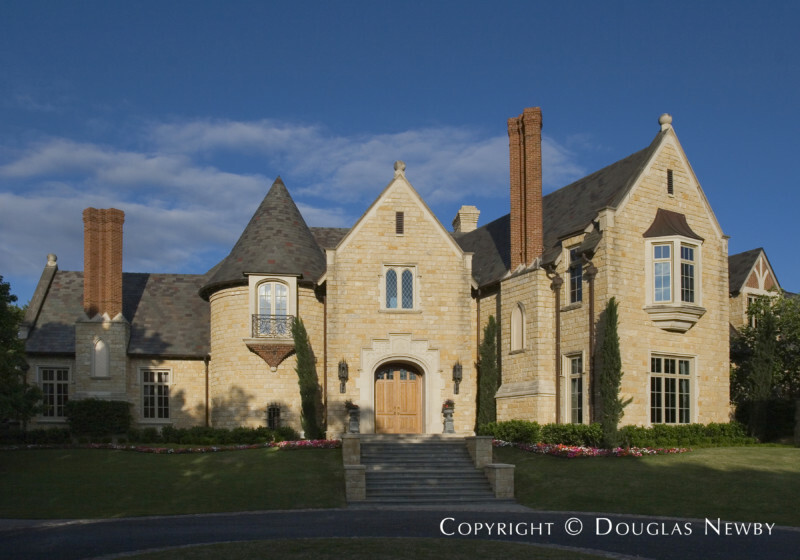 Larry Boerder, defining great architecture in Dallas, pulled from the eclectic European vocabulary of the Edwardian estate homes to design this architectural master work. Grand rooms with tall arched windows overlook the gardens. 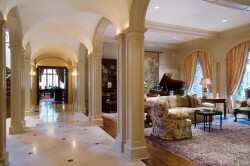 A sumptuous mahogany library with mixed wood floors including burled walnut is breathtaking, elegant and inviting. A beautiful open hall connects rooms intersecting at slight angles to avoid the monotony of a flat façade or the endless repetition of rooms found in a linear floor plan. Extraordinary craftsmanship and detail create aesthetic continuity to rooms designed for every mood or occasion, from a drawing room to a billiards room. Deep foundation piers, steel beam construction and slate roof speak to the engineering and structural quality of the home. Low-voltage lighting helps accentuate the lovely spaces. Rich surfaces include herringbone patterned wood floors and Pennsylvania blue stone. Fireplaces are found in the formal, informal and private rooms. Two of the second floor bedrooms have balconies overlooking the rear garden. The master bedroom suite on the first floor even has a private screened porch overlooking a private lawn, creek and forest. Besides a sweeping staircase in the entry hall and a private staircase from the kitchen, an elevator takes you to all floors including a theater for 20 on a lower floor that is reminiscent of the Majestic Theater. You will find within the kitchen and butler’s pantry three sinks, a Sub-Zero icemaker, Sub-Zero refrigerator and freezer, two Asko dishwashers, Dacor double ovens and a six-burner, two-oven Viking. Two garages with a total of seven bays accommodate 10 cars. Two sets of quarters can accommodate a guest or staff for this five bedroom, five bath and four half-bath home. Tom Matter was the builder. The landscape was designed and installed by Robert Bellamy and the phone system and audio visual by Dallas Light and Sound. This home and 5.3 acre site offer an extraordinary environment to raise a family or entertain. It represents real value as it is priced at a fraction of its replacement value and slightly over land value. For more information contact Douglas Newby at 214-522-1000.